Dina Silver emerged on the scene this year with her novel, One Pink Line, a favorite of mine for sure. Her novels focus on smart women you sometimes want to wag your finger at. Or shake…maybe a little. Because you care, which is the sign of well-written characters, even if they’re not doing exactly what you want them to do. Sadly, for so many reviewers, this equals bad character development if they’re not always “likeable”. I shake my head at these reviewers…and possibly my finger. Finding Bliss introduces us to Chloe, the whip-smart best friend of Grace, whom we met in One Pink Line. 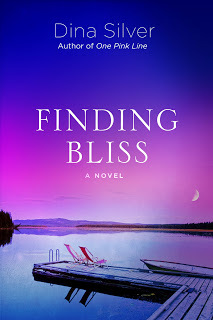 This isn’t a sequel, but I’d highly recommend reading One Pink Line before Finding Bliss because a few of the minor characters in Finding Bliss are developed there. They’re characters worth knowing and loving. Chloe’s home life hasn’t been fantastic and she’s driven to build a life for herself in suburban Chicago by attending law school at Northwestern University. To earn her way, she works as a Summer Girl for the Reed family, caring for their 8-year-old twins. Dr. Reed is largely absent from the story (and his family). Mrs. Reed is the quintessential doctor’s wife. She is a passive-aggressive Southern Belle transplanted to Chicago, referring to everyone as “dahling” and smiling while delivering less-than-beautiful statements about everything under the sun. You know the type. As long as everything appears perfect, it’s good enough for her. Enter Tyler Reed, the golden boy oldest son, whom Chloe has been crushing on from afar for years. A football star during high school in suburban Glenview and then Rose Bowl-bound at The University of Notre Dame, these two come from different backgrounds and perspectives of the world. Let the romance, and the struggles, begin! Over time we’re introduced to many characters, including Cam, Chloe’s law school neighbor and dear friend. It’s not a conventional love triangle, as Chloe’s choices for Tyler are always very clear to the reader, although there will always be questions about Tyler. His behavior plants seeds early on that will keep you wondering throughout the story. Cam is a wild card. What are his motives anyway? Delicious and subtle (and perhaps frustrating) for the reader, as there are no clear answers…only more story. A quick disclaimer that this book deals heavily with the journey though infertility and its treatments. I recognized so many of my friends in this story and their pain is palpable, as is Chloe’s. A warning. When you hit THAT POINT in the book where your adrenaline surges and you’re angry and feeling ALL the feels, solider on, reader. Finish the book and the epilogue. Breathe. Pour a drink. Even sleep on it. Then go back and re-read the last 5 or so chapters to really feel it again to find the Happily Ever After. It may not be a typical one, but it’s VERY satisfying once your heart isn’t beating in your ears. It will start to remind you of people you know and love. No caricatures here. I greatly hope Dina Silver writes Chloe into her next book much the way she wrote Grace and the rest of the family into Finding Bliss. I loved knowing more about their story after falling in love with them in One Pink Line. Finding Bliss IS Chloe’s story, but once you love characters, you want to keep loving them. Read this in your book club for a great conversation about modern women and the choices we make. It’s sure to be lively.